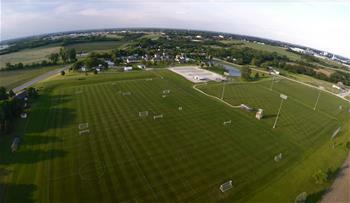 The Pella Soccer Complex is a 10 field complex, with field sizes ranging from U6-U19. Concessions may be available at the Soccer Complex for tournament or league play. Permanent restroom facilities are available on site. Gene Van Wyk Game Field - is a full sized game field with lights and bleachers. U19 Practice Field - is an unlighted full sized field. Depending on the season other field sizes will vary. Parking is only allowed in the designated gravel parking lot. No vehicles are allowed on the fields, grassy areas, or walkways. Parking is also not allowed on the entrance drive. Information regarding rates can be found in our general guidelines. To make reservations please contact the Community Services office at 641.628.4571. The Pella Soccer Complex is located at 907 218th Ave, Pella, IA. Pets/animals, alcoholic beverages, smoking/nicotine and weapons are prohibited at the Pella Soccer Complex. See the full Rules and Regulations for additional information.